The closer I get to taking our trip to England—and a few other European Vacation spots—the harder it is to keep posting my virtual, make-believe, imaginary, walk in London! For this week’s British Isles Friday, I’m taking you back to the beginning again, to see where I started which was at Heathrow. Funniest thing? For our real trip, we’re flying into Gatwick! You know what I like to say—life is what happens while you’re busy making other plans. Just a little over two weeks and a few days until we get there for real. I can’t promise to write as much as I’m want to do—probably a relief for some of you—but I hope to post lots and lots of pictures. Cheers! Welcome to Day 1 of my virtual walking tour of the London Underground system. After earning Fitbit’s London Underground badge for walking the equivalent of the Underground’s 250 mile length, I got the bright idea of walking the real one. Er, not exactly the real one: I’ll be spending my Fridays on an imaginary 10,000 step a day trek walking the route that commuters and tourists take on the Tube in and around the City of London every day. But where to start? The beginning is always a good place to start but looking at this labyrinth it took me awhile to figure out where the beginning was. Was it in the heart of London, at Victoria Station where the tube meets the train? At Picadilly Circus? At Upminster on the far right? Then I realized the beginning for me could only be Heathrow Airport, where I’ll land in Terminal 2, the Queen’s terminal, after a fictional first class flight from Los Angeles. Refreshed and ready to start walking, I’ll find the Picadilly line which starts at Heathrow over at the bottom left of the map, and head out from there. My first class ticket on Virgin Atlantic—they call it Upper Class which feels, oh I don’t know, snooty? — gives me a nice big comfy chair that converts to a bed. But who can sleep? I’m flanked one either side by a couple of dishy men and yet, miraculously, I have both the aisle seat and the window seat. I won’t have to tuck in my rear and bumble my way past anyone’s knees to get to the loo. I won’t have to disturb someone sleeping with the window shade pulled down just so I can see the view. “Craig. Daniel Craig” says the attractive blondish man to my left, narrowing his steely blue eyes. “Carter. Sim Carter” I manage to sputter, feeling all fluttery inside. “Colin Firth, actually” murmurs the man on my right, reaching out to shake my hand and dimpling in a charming self-deprecating manner that says he knows all about my Mr. Darcy fantasies. Later Daniel Craig will order two martinis, shaken not stirred, while Colin Firth requests a pot of tea for two. Yes, please. Both, please. This is my fantasy flight, and I want it all. After chasing a cup of tea with a martini or two or three and giggling (that preflight glass of Gardet Brut Premier Cru Champagne really hit the spot) all through dinner as Colin and Daniel—we’re on a first name basis now—try to outdo each other with one fascinating story after another, we all settle back for a little quiet time. Colin dons some heavy black framed spectacles which make him inexplicably sexier, like the inverse of the old librarian joke, and is going over his copy of the Bridget Jone’s Baby screenplay with a Stabilo Boss highlighter pen. Daniel is reading the second in Stieg Larsson’s bestselling Swedish crime trilogy, The Girl Who Played with Fire. Me? I’m torn between reading pretending to read Thomas Pynchon’s The Crying of Lot 49 or Ulysses by James Joyce, just so Colin will turn to me and say “Right, so you’re bloody brilliant aren’t you? I suspected as much!” prompting Daniel to ask what I thought of his take on Mikael Blomkvist vs the original Swedish actor's portrayal of the character in The Girl with the Dragon Tattoo. Or perhaps he’ll simply look at the book cover and see right through me. He’ll raise one eyebrow and ask “layer cake?” as in, would I like to eat a piece of cake instead of pretending to fathom what Pynchon is going on about. No, that won’t do. Instead I pull out my Parker 51—the same model pen the Queen uses—and make a few notations in my blue lambskin Soho journal from Smythson of Bond Street. My handwriting is astonishingly legible and I’m shocked—no, make that ‘gob-smacked’ —that I can actually read my own notes. Then I remember that my handwriting is suddenly neat for the same reason that I look, not only twenty years younger, but suddenly like a cross between Rosamund Pike, Emily Blunt and Kate Winslet; this is a flight of fantasy. I don’t own a journal encased in beautiful soft leather the color of the sky and my idea of a good pen is a Pilot Precise V7. When I write by hand, it’s in a composition notebook with a mottled black & white cardboard cover that set me back a buck seventy nine. 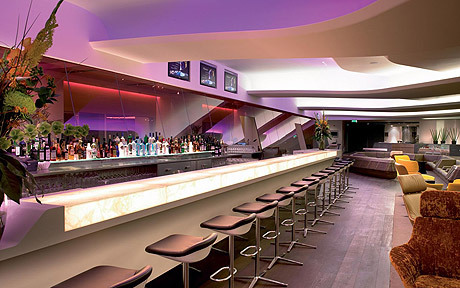 When we land, we all admit to feeling a wee bit peckish so we head to the Virgin Atlantic Clubhouse for a quick pick me up. Daniel offers me a lift into London in his Aston Martin—it’s an endangered species, one of the few remaining Aston Martins not destroyed in a Bond flick—while the studio has sent a Jaguar for Colin even though, he confides to me, he’d be much happier in a Toyota Prius. “Thank you boys” I tell them, throwing my bag over my shoulder and my best all-encompassing smile in their direction, “but these boots are made for walking, and that’s just what I’ll do.” Proving once and for all this is nothing but a dream. The real me would thank my lucky stars and take the ride, either ride, and begin my London Underground quest another time. Just like that Colin and Daniel, never really there, disappear. I don’t even watch them drive away, they’re just gone. What remains is the map to the London Underground and my 10,000 steps every Friday along the route. Next week, stop one on the Piccadilly line: Hounslow. I wonder what we’ll find there? Join me for Day 2.